Only a couple of weeks since Dhakaites recovered from a prolonged flood, another rain-borne flood hit Dhaka on September 13. The three-day long heavy shower caused serious waterlogging in the city, yet again. For three days, life came to a virtual standstill. People were forced into self-imprisonment, business came to a halt, and acute crisis of drinking water made life unbearable. Waterlogging, once thought to be a problem only for a few low-lying areas in Dhaka, has suddenly threatened to become a regular event in the rainy season. Could this waterlogging have been avoided? 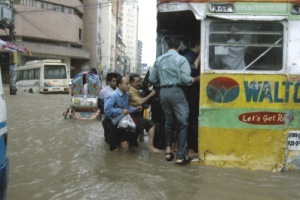 What can we do to protect Dhaka from getting waterlogged in the future?